It is a dramatic time after an earthquakes struck Nepal on April 25th and hundreds of aftershocks followed. 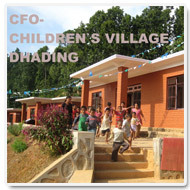 CFO-Nepal helped with providing food, tarps, blankets and, even more importantly, with establishing CGI Sheet-Temporary Shelters before the the reconstruction time began. More than 200 families were equipped with temporary shelters in the severely hit Dhading, Sindhupalchowk, Dolakha and Gorkha Districts. The support is ongoing and again thank you from the bottom of our hearts for making this help possible.